HP Umpire Andy Fletcher ejected Marlins RF Cameron Maybin (strike two call; QOCN) in the top of the 4th inning of the Marlins-Rays game. With none out and one on (R1), Maybin took a 1-1 slider from Rays pitcher Chris Archer for a called second strike, before subsequently striking out on a 2-2 pitch. Replays indicate the 1-1 pitch was located off the outer edge of home plate and thigh-high (px 1.075, pz 2.005) and the 2-2 pitch was located over the outer half of home plate and at the hollow of the knee (px .600, pz 1.604 [sz_bot 1.69 / RAD 1.813]), the call was incorrect. * At the time of the ejection, the Marlins were leading, 4-1. The Rays ultimately won the contest, 6-4. This is Andy Fletcher (49)'s third ejection of 2018. 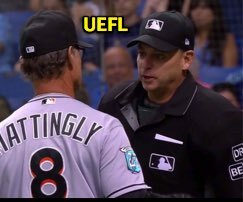 Andy Fletcher now has 0 points in the UEFL Standings (2 Prev + 2 MLB - 4 Incorrect Call = 0). Crew Chief Jeff Nelson now has 2 points in Crew Division (2 Previous + 0 Incorrect Call = 2). *Despite the correctness of the strike three call, E-QOC is incorrect pursuant to UEFL Rule 6-5-c (and 6-5-c-5-a) pertaining to the 1-1 pitch located off the plate and ruled as strike two. *Related: Intra-AB ball/strike QOCU proposal was voted down during the 2017 UEFL Rules Summit. *The 1-1 pitch was located 1.932 horizontal inches from being deemed a correct call. This is the 103rd ejection report of the 2018 MLB regular season. This is the 51st player ejection of 2018. Prior to ejection, Maybin was 0-1 (SO) in the contest. This is Miami's 3rd ejection of 2018, T-2nd in the NL East (NYM 5; MIA, WAS 3; ATL 2; PHI 0). This is Cameron Maybin's first ejection since September 25, 2016 (Dan Iassogna; QOC = Y [Balls/Strikes]). This is Andy Fletcher's 3rd ejection of 2018, 1st since June 19 (Don Mattingly; QOC = U [Throwing At]).